Red Apple sent this for me to review. They gave me the exfoliate stick and another mineral lipstick. I love both of them. From packaging to the product itself, I definitely recommend Red Apple to everyone. These babies were carefully packed in a bubble-wrapped enveloped and also has this wonderful pouch with Red Apple Lipstick label on it. Inside the pouch, it's covered with an apple green paper. They're just showing how they really care for the environment based on the color they've chosen. Pretty! I was like a little kid giggling over candy when I tried both on. I can't stop loving both items and what the label has to offer. First, I got their Exfoliate Stick. It basically exfoliates the lips, thus removing dead skin. I've been trying to find an exfoliate lippie and see what I got! 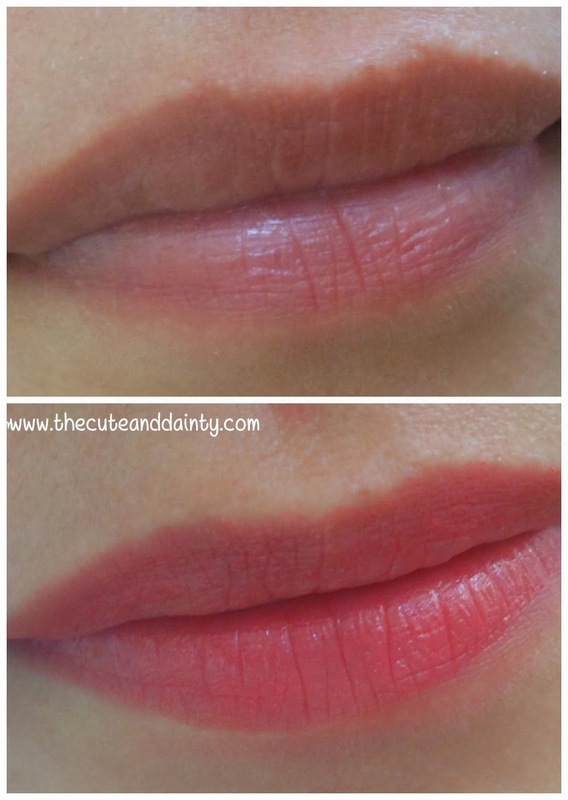 When I applied this, I saw a huge difference on my lips. See how my bare lips turned pretty. It looks healthy. So after exfoliating my lips, I can just apply this Coral Crush Mineral Lipstick and I'm all set. I love the color, the texture, the creaminess, not to mention that it's a very healthy one! Just like before, you notice me reviewing coral shades because it suits my tone and I love that it looks natural on me. It's just the same with this one, only better. Free of pollutants such as parabens, gluten based derivatives, petroleum, etc. Disclaimer: This product was sent to me for free in exchange of a review. All thoughts on this post are of my honest opinion. Pretty color right?! I tell you, they're really lovely! This is a nice innovation in beauty lines. Ngayon lang ako nakarinig ng exfoliating lipstick. Most products in the markets exfoliate only the skin and lips are not included. Though meron naman but it's not too popular. You can exfoliate your lips by mixing ingredients etc, not in tubes kasi. Great color. The exfoliate stick looks like it works. I would love to get one. My lips need it. You can order it from them for only $17 sis. Really worth it! No! Don't do that! You will just end up with ugly lips.Try putting vaseline na lang sis before going to bed para di mag-chapped lips mo and to avoid dead skin. It's only now that I'm enjoying the wonders of lip exfoliation. I made my own lip scrub out of curiosity of its effectiveness and it worked. It's great on removing dead skin on lips. How do you make your DIY lip scrub? is that the one with a brown sugar? I just mixed sugar (I think any type of sugar will do), petroleum jelly and baby oil. Petroleum jelly with sugar? That sounds interesting. I think for exfoliation, brown sugar is the best. Want To Join A Blogging Conference In Pluto? May Commenter of the Month + April Winner!